They say women talk an average of 13,000 words more per day than the average man. In my household this is not true, it’s completely reversed. My son talks far more than anyone in the family and with the nature of my husband’s job he certainly, without a doubt talks twice as much as myself. “For the 3rd time, make your bed!” I hear myself saying like a broken record to my son. Every day we are bombarded by the voices speaking to us through social media, through music, through the newspapers, through popular opinions, through friends and family. It’s overwhelming. It becomes like “white noise” and so we can have a tendency of switching off. Hearing but not truly listening. In this modern age of communication overload, I have to question…Have we shut off and turned a deaf ear to the still small voice of the Holy Spirit? Does the word of God still penetrate our minds above the voices of this world? There are many loud voices speaking into our society at the moment, and now more than ever we must tune in to the still, small voice of God. Not only hearing His word but listening, understanding and obeying. Whilst worldly popular opinions are making headlines, are we embracing God’s word and outworking it in our lives or does it blend into the monotonous humdrum which vie for our attention daily? If we are to listen and not just merely hear we must daily meditate on scripture. It doesn’t have to be huge chunks. It could be just one or two verses which resonate with you. Speak them over and over like a mantra. There is power in repetition. Alternatively, listen to the audio version of your favourite translation of the Bible. You’d be surprised how much you take in and what verses spring out and speak to you as you listen. Secondly, know the voice of God. Get familiar with the voice of God. Take time to listen and journal what He is saying to you. The more you do this the more you will recognise when He is speaking to you. Note: He will never contradict His word. We are here as Christians on this earth to make a difference. It’s very easy to keep quiet and go about our daily business minding our own business. 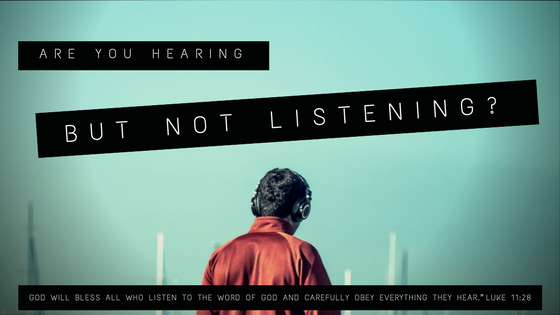 But God is challenging us in this very hour not simply hear Him, but listen to Him and obey. We are His hands, His feet. He wants to shine through us. His words needs to be in our mouths to speak, hope, truth and life into this earth. BELIEVE & CONFESS: 3 FOR THE PRICE OF 2! This little book written by Jarrod & myself is a perfect devotional gift for Christmas. Full of inspirational pictures and quotes, with 7 faith building chapters followed by 7 daily confessions. Click here to buy 3 for the price of 2.